Charleston, 2009, enamel on aluminum, 109x97x42.5 inches. 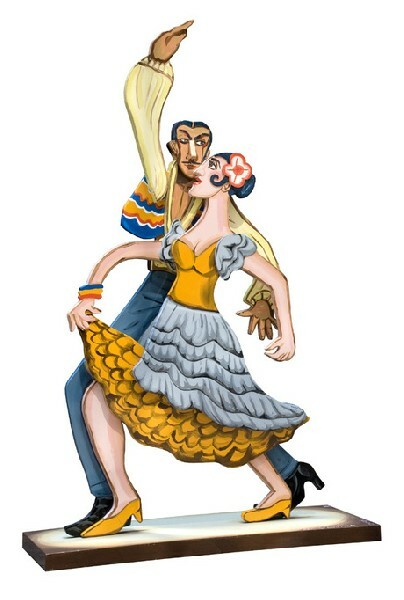 Flamenco Dancers, 2008, enamel on aluminum, 148.5x96.5x37 inches. 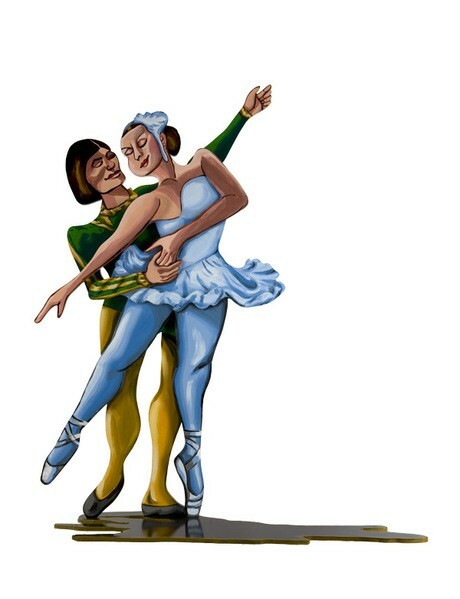 Swan Lake, 2009, enamel on aluminum, 108.5x93.40 inches. 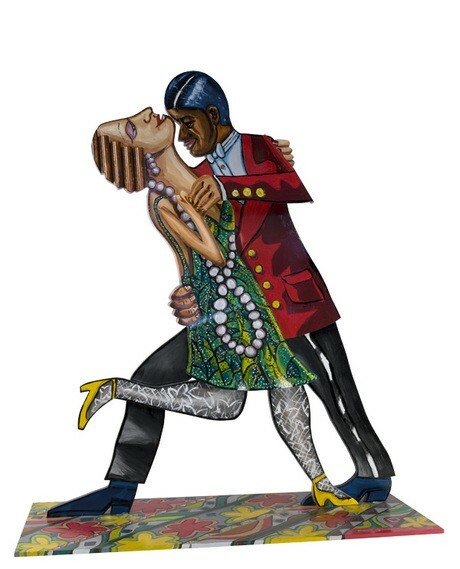 Tango Dancers, 2005, enamel on aluminum, 109x38x96 inches. Red Grooms has been documenting people from early Figurative Expressionist paintings of city figures that seem to be isolated in space, to his bustling city scenes. Since the early sixties Grooms' work blends pop art iconography with emotion and painterly techniques of Expressionism, creating a hybrid form of Pop Expressionism. Grooms was also one of the pioneers of experimental animation, happenings, and installation art. The Marlborough gallery in Chelsea presents five of Grooms' monumental sculptures with the theme of dancing. 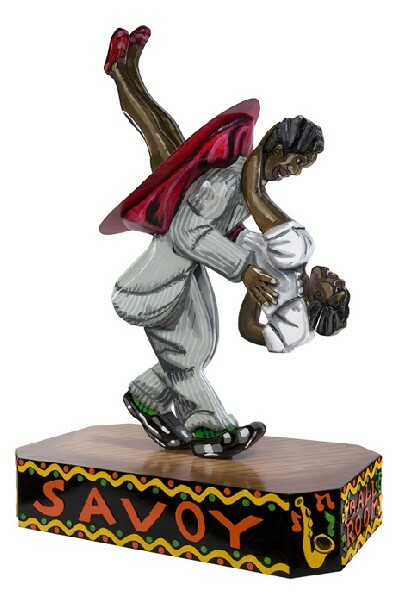 Each sculpture depicts a specific dance like Tango Dancers (2005), where a debonair man dips his stunning partner. The other dance forms include Flamenco Dancers (2008), The Lindy Hop (2009), Charleston (2009), and Swan Lake (2009). These sculptures freeze a moment in time where passion and expression run free. Through Grooms' magnificent use of color and his rendering of the human figure, we are presented with very lively renditions of dancing. In Swan Lake, the passion of the dancers' faces shows the intimacy of the moment. This piece was inspired by an image of the famous dancers Alexandra Danilova and Igor Youskevitch performing in Tchaikovsky's masterpiece. 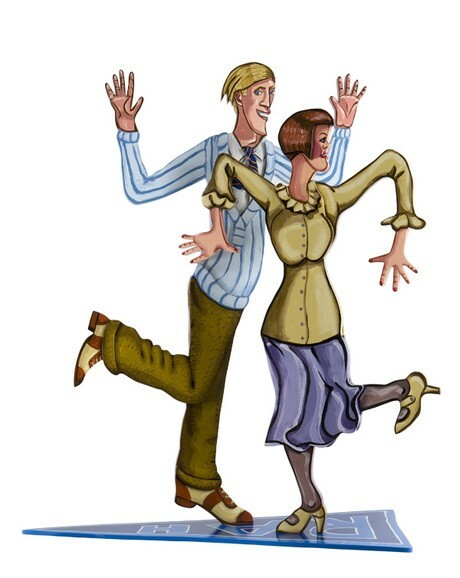 In Lindy Hop the dynamistic athleticism of the dancers is revealed as she flings her legs above her head, while the man holds her diagonally well above the floor. We can get a sense of the tones and sounds that would be present if each of these sculptures came to life. As Grooms continuously does with each new installation and production, Dancing creates a monumental presentation that leaves us astounded and nostalgic for the spirited pleasurable parts of human nature.